The Fellowship was fortunate enough to obtain a copy of BATMAN/TEENAGE MUTANT NINJA TURTLES ADVENTURES #1 from IDW Publishing and DC Comics. The story is by Matthew Manning, with art by Jon Sommariva, inks by Sean Parsons, colors by Leonardo Ito, and letters by Shawn Lee. The Turtles return from their nightly patrol to discover that a portal has been used nearby. Our heroes investigate, but run into someone they did not expect. Meanwhile, Batman is investigating the disappearance by several of his enemies from Arkham Asylum. But where in the world are they? Or the question should be which world are they? How did they get there? Who is behind this? So many questions with no answers…yet. The mystery begins. Matthew Manning nails it with this script. He’s able to introduce the characters, develop the mystery, delivers on the action and makes it fun. Sommariva, Parsons, and Ito do a perfect job of melding the styles of the two unique looks of the animated series and make it look like it was meant to be. This was a fun read and can’t wait for the next issue. Pick it up! 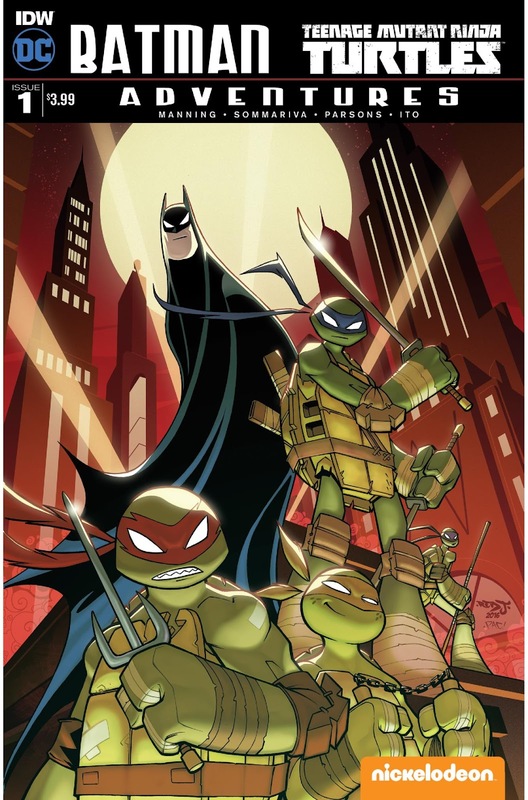 BATMAN/TEENAGE MUTANT NINJA TURTLES ADVENTURES #1 is in stores now or available at www.IDWPublishing.com.